Treatment for children’s cancer has changed significantly over the past 50 years. Once considered a fatal disease, the five-year survival rate is now over 80% for all types of cancers. This article explains how children’s cancer nursing has contributed to the improved care, treatment and outcomes for children and young people with cancer. It shows how nursing has been fundamental to the development of the specialty, and the changes that have led to improved service provision. 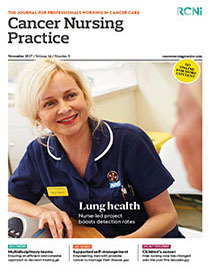 The article also describes the important role of the Royal College of Nursing (RCN) Paediatric Oncology Nurses Forum in establishing the clinical and professional nursing base, increasing nursing research and using evidence in practice.